After celebrating my last day of Songkran by getting blackout drunk, breaking my friend’s nose, almost breaking my toe and getting locked into a building from the outside – I think I had done enough damage in Chiang Mai to be ready to leave the country. Our new group of Strays hopped into the van, and we headed north to the Thai-Laos border crossing in Chiang Khong. 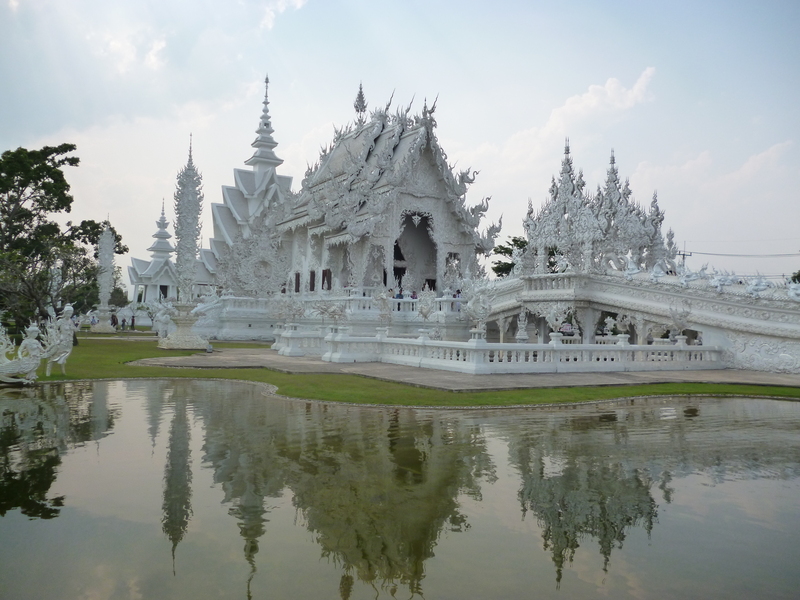 Our guide told us that along the way we would make a stop to check out the White Temple (Wat Rong Khun) in Chiang Rai. At this point I was starting to suffer from temple-itis and was none too excited to get out of the air conditioning to see yet another Buddha. Thankfully, I didn’t listen to my stupid self. 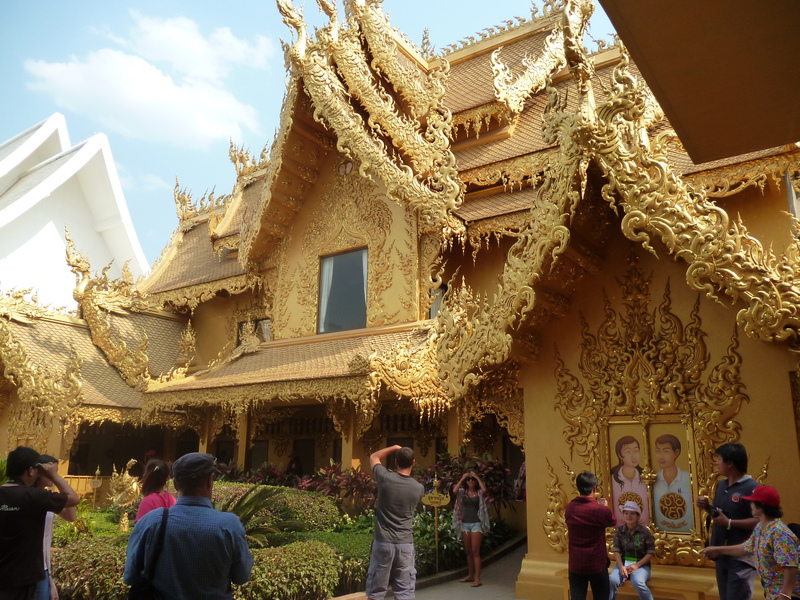 Wat Rong Khun is the poo – so take a big whiff. 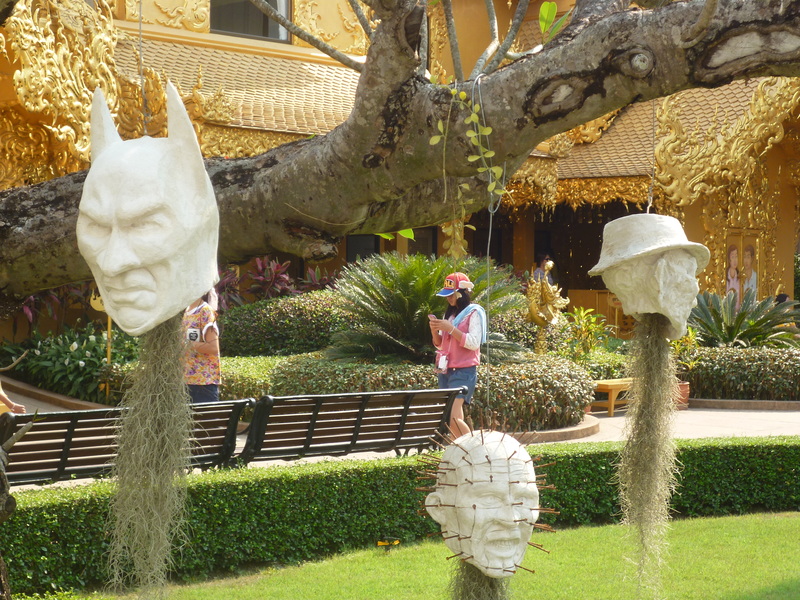 While it has the typical features of a Buddhist temple – layered, triangular, shingled roofs, mythical creatures, Nagas and whatnot, I’ve never seen a temple done in all white, and I’ve certainly never experienced one that features Predator, Batman and Freddie Kreuger among its guardians. The designer of the temple, Chaloemchai Khositphiphat (I obviously looked his name up as I’m pretty sure knowing that name off hand is next to impossible for a Westerner) is a well known, local Buddhist artist who’s been developing the temple as funding rolls in. 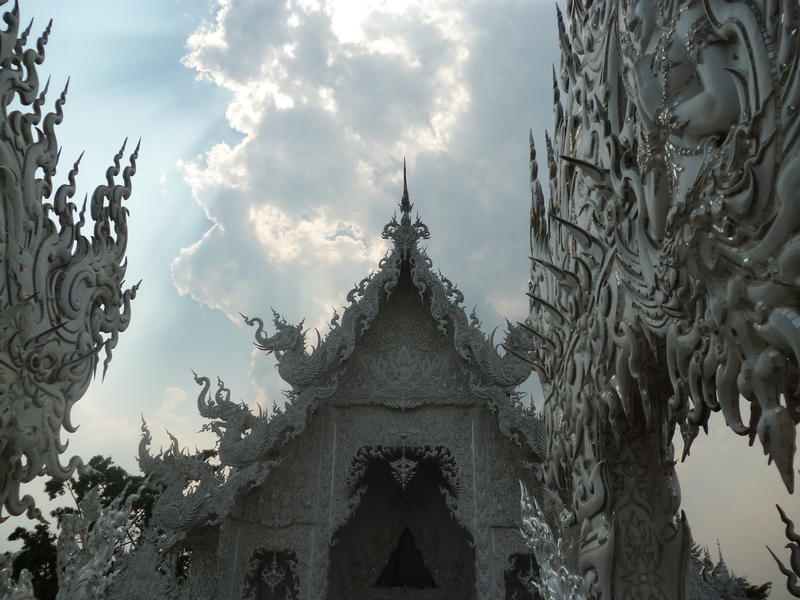 The whole thing is done in a white aesthetic, and is made to represent crossing into the afterlife while lost souls reach up for you as you pass over the bridge into the religious sanctuary. It somehow took my breath away, was slightly creepy and made me laugh at yet another bizzare Asian interpretation of Western culture, all at the same damn time. And while you might think that the inside of a temple would be normal, where, you know, people pray and stuff, the inside of the temple was just as ridiculously awesome. Emphasis on ridiculous. As you look up and down the gold hued walls, they depict the battle between good and evil, as represented by pop culture characters. Among said characters are Michael Jackson, Blue Bear, Superman, Spider Man, Bin Laden and the Twin Towers. You can make your own assumptions about which are the heroes and which are the evil doers. During all this, people in the center of the room are intently praying, which only further adds to the surreal ambiance of the temple. The whole thing kind of feels like Banksy meets Buddhist Bible study, and I mean that in the best way possible. Though the process of seeing the whole temple couldn’t have taken more than forty-five minutes, I would consider it touristically one of the highlights of my trip to northern Thailand. On the other hand, I did skip the very popular Tiger Kingdom where you can cuddle with drugged out tigers, and also the infamous elephant riding. 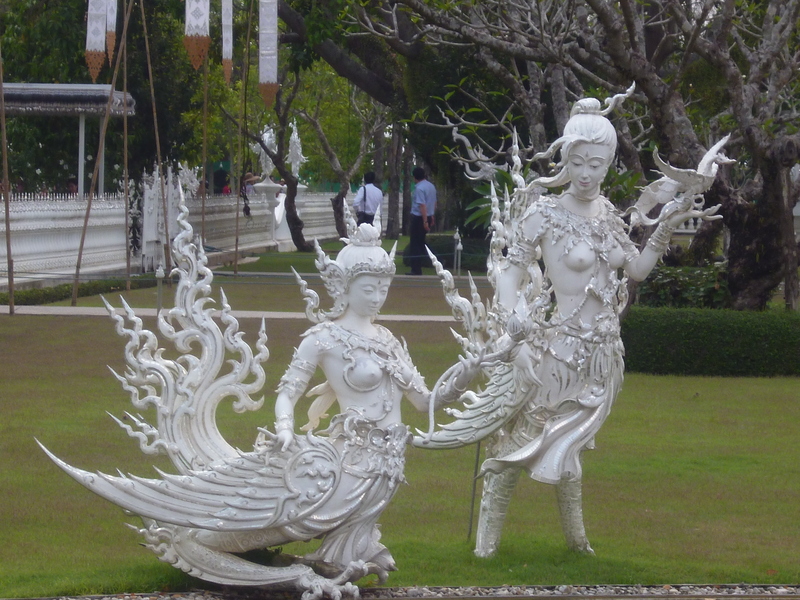 But, if you ever need to take a world class piss in the most insanely over designed public restroom ever, Wat Rong Khun is the place to go. You definitely have to – and you have to get to Asia! And if you see anything new there you have to send me pictures!